Journey through America's national parks with the most impressive quarter album ever produced. 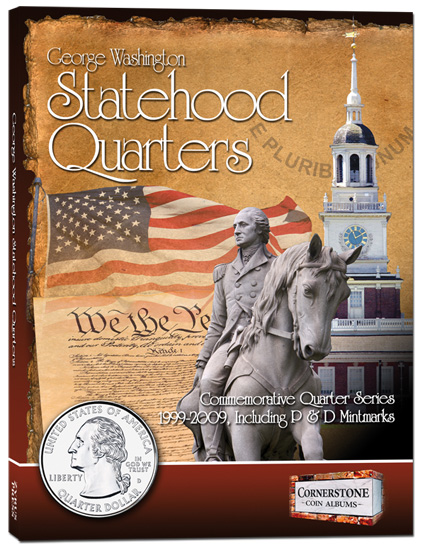 The Cornerstone National Park Quarters Album provides 56 slots for both Philadelphia and Denver mint examples of the US Mints America the Beautiful Quarters program for a combined display of 112 coins. You'll enjoy front and back viewing of your coin collection set within a full color coin album detailed with history, facts and expanded knowledge of America's quarters. Item sold is album only. Quarters are not included. Cornerstone Coin Albums has developed the most spectacular coin album ever produced. Its cover only begins to display how wonderfully constructed and colorfully detailed this album is. You will begin your journey through our national park quarters with an outline history of America�s national parks on the inside front cover. 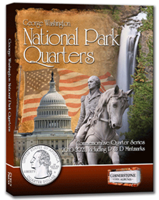 From there you will continue to gain in-depth knowledge of the America the Beautiful National Park Quarters program through the information that is printed on each page. Novice and experienced collectors will all gain a new understanding of collecting quarters. Each page holds both a Philadelphia and Denver mint example of each quarter produced within a two year period for a total of 20 quarters per page. All quarters sit within the page and are held in place with acetate protective sheets on the front and back so that you will have two sided viewing of your entire collection.